Source: Statutory Framework for EYFS (2014). At Lyonsdown School, EYFS refers to the Nursery and Reception classes. These children have similar basic needs but are different physically and emotionally. Good early practice provides a variety of experiences starting from the child’s personal development and lays the foundations for future learning. 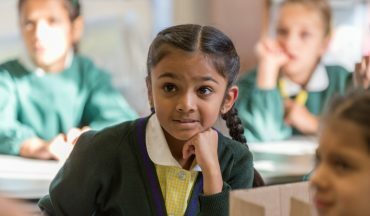 The EYFS curriculum is based on seven areas of learning and development, all important and interconnected. Talking, listening, discussing and reflecting on experience in a widening range of situations. Expressing opinions and making choices. Enjoying, making, sharing and telling stories. Sharing British and other cultural and religious festivals and traditions. Developing and practising fine and gross motor skills. Mastering the use of tools. Developing competence, independence and interdependence. Developing confidence, stamina, strength and energy. Expressing and communicating through movement. Understanding how the body works. Developing healthy choices regarding food. Making meaningful relationships with adults and other children. Respect for and empathy with others. Being an individual and belonging to a community. Developing independence and helping others. Making choices and taking responsibility. Developing a strong self-image and self-esteem knowing that their feelings and views are valued. Gaining confidence in the ability to succeed. Expressing and managing feelings and emotions. Developing a sense of justice and fairness. Exploring print in a meaningful context. Developing competence as readers and writers. Counting, understanding and using numbers. Finding and calculating solutions to mathematical problems. Developing awareness of time and money. Exploring and comparing quantities, shapes and measures. Celebrating and marking British occasions and festivals. Sharing other cultural and religious festivals and traditions. Understanding other places and times. Learning about British heritage and history. Developing awareness about past and present events in their own lives and in the lives of others. Being curious and observing closely. Making sense of how things work and why things happen. Exploring, experimenting and testing ideas. Using technology for a variety of purposes. Developing critical thinking and solving problems. Sharing the pleasure of finding things out. Representing and communicating ideas, thoughts and feelings through a variety of art, design and technology, music, movement, dance, imaginative and role playing activities. Imagining, wondering, expressing and creating. Experiencing, appreciating and creating beauty. Playing and exploring – for EYFS children, ‘play’ is the natural vehicle of learning. We aim to build on each child’s early experiences gained at home or from other pre-school experiences. Importance is placed on the children feeling happy and comfortable in their learning environment. We encourage them to ‘have a go’, to experiment, think, create, talk and question, to solve as far as possible their own problems and to carry an activity successfully through to the end. In this way we encourage them to become independent learners, building their self-esteem and confidence. 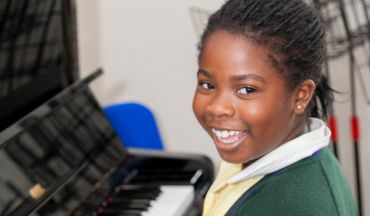 Active learning – children are encouraged to persevere and enjoy their achievements. Creating and thinking critically – children learn to develop their own ideas and strategies. The learning environment is flexible, in response to children’s changing interests and abilities. Emphasis is placed on adults in the environment listening to and talking to the children as they play, in order to judge the right time to step in and lead them forward by asking questions, making suggestions or providing relevant knowledge, information and additional materials. Throughout the EYFS we start with the concrete and move through to the more abstract. Recognising that children develop and learn in different ways and at different rates, we provide each child time to learn through his/her environment using the toys and games available. We help them develop their fine motor control, pincer grip, hand-eye co-ordination etc. through threading, using pegs, construction toys and various art and craft activities, to foster the ability to hold a pencil well. The children are given many opportunities for free play, guided by the staff who discuss with them what they are doing and how they are going to develop their ideas. This encourages the child to extend vocabulary and develop communication skills. Large group activities such as singing, music and movement, games and action songs all help build confidence and communication skills. We place high importance on circle time activities, which help the children develop listening skills, increase concentration and build confidence. We also instil in the children the concept of good manners, respecting others and being aware of feelings, both our own and those of others. Story time is another important part of the timetable, either in a large group or as smaller groups or individual activity. When ready, the child is given the opportunity to put his/her ideas, thoughts and knowledge on to paper in a formal way. Reading and writing are introduced through phonics. Sounds are learned with a multi-sensory approach using body movement, ears, eyes and speech to help memory. Number work is approached in a similar fashion with songs, rhymes and games. Each child is treated as an individual. If a child is happy, content and given the opportunity to develop their skills, then they will flourish within their environment. Encouraging continual dialogue between parents/carers and staff. Providing good quality information about all aspects of the EYFS classes, practice and policies. Providing opportunities for parents/carers to learn about the EYFS curriculum through meetings and literature sent home. Class teachers being available for informal consultations at the start and end of each day by appointment only. Parents are offered the opportunity for formal consultations and written reports are sent home. We aim to cater for each child’s individual needs. 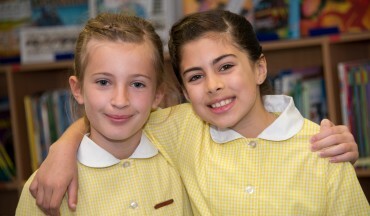 Our integration of children is in line with the whole school policies for equal opportunities. In addition to this, as an EYFS team we aim to provide support for children with special educational needs with the support of the SENCO. “I enjoy playing with my friends”.